The billboard is on I-70 in Saline County. 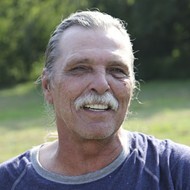 Efforts to release Jeff Mizanskey, the only man in Missouri serving a life-without-parole sentence for a nonviolent marijuana charge, are continuing this month with help from Show-Me Cannabis and Change.org. Show-Me Cannabis has bought billboard space on I-70 near Kansas City (and near Sedalia, where Mizanskey was arrested). 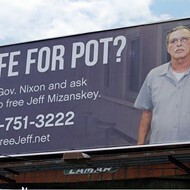 The billboard features a photo of Mizanskey and says: "Life without parole for cannabis? 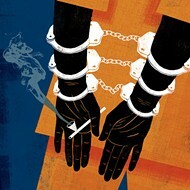 It's time we fix our unjust marijuana laws." A photo of the billboard, which is on I-70 in Saline County, not far from where Mizanskey was arrested in Sedalia, can be seen above. John Payne, executive director of Show-Me Cannabis, says this will be the first of several billboards the pro-legalization group will put up regarding the state's marijuana laws. 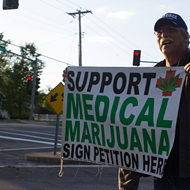 In addition to Mizanskey, the group is planning to feature other victims of current marijuana laws, including people who need to use medicinal marijuana. But billboards aren't the only way Mizanskey, who is nearing 21 years in prison for racking up three marijuana felonies (the biggest being only six pounds of pot), is getting attention for his plight. According to Tony Nenninger, an attorney who has helped garner attention for Mizanskey's clemency efforts, a press conference will be held this month in Jefferson City to deliver a Change.org petition to Governor Jay Nixon asking for Mizanskey's release. "There are over 360,000 online signatures that will be reduced to paper and carried up the steps to the governor's office," Nenninger tells us. The press conference will be held at 1 p.m. on April 28 near the capitol rotunda.